A beautiful combination of materials and warm colours fill the living rooms of this house and make it the ideal place to spend a vacation with friends or family. Decorated with great detail from lighting at the touch of the sheets. Equipped with everything necessary so that as you're in your house. Kitchen, kitchenware, linens, appliances, etc.. Located in the heart strategic, the house is an excellent destination for getting lost in this beautiful land and discover beautiful and wonderful corners routes monumental (Salamanca, Ávila, Alba de Tormes). Let yourself be seduced by the warmth of a home imbued with all the comfort and luxury of best hotel. Windsurfing: The proximity of the River Tormes, provide fishing enthusiasts enjoy their hobby, both in the box of Galisancho as in the swamp of Santa Teresa . If you like sports of sailing, (windsurfing, etc.) in the same swamp you can practice or enjoy bathing in recreational areas enabled. We are simple people and workers. We like the country life, being surrounded by family and friends. We love meeting new people from other parts of the world. All bathrooms are spacious and decorated with style and with great detail. Two fireplaces, one in the dining room and the other in the outside hall, built in the garden to enjoy winter and summer. This fireplace is also a barbecue. The area is very large garden, the pool is community is 100 metres from the house. The mattresses, pillows, towels and bed linen are of top quality. They are designed to relax and enjoy the host. Gran casa rural muy buena ubicación. Muy recomendable. Pocas veces nos hemos encontrado con una casa rural tan bien repartida para grupos familiares grandes. No tiene habitación mala, son todas muy grandes y cómodas. No tienen piscina pero la municipal está a 5 minutos a pie y es muy cómoda. Los dueños lo tienen todo muy bien organizado y nos sentimos muy bien recibidos y acogidos. En la cocina no falta de nada. La verdad, de las mejores casas rurales en las que nos hemos quedado. Golf: The golf course is considered the most difficult one of the region Castilla-L?on. The two rounds of the course are very different. To book the customer must enter the bank account 30% of their stay. You should contact the owners to obtain bank account number. Prices shown are for 10 people. 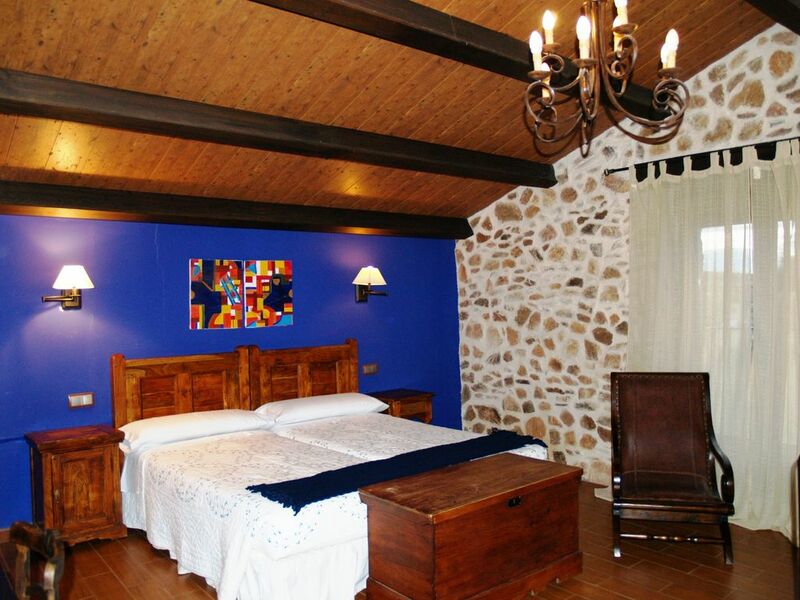 The price for additional persons is 19 euros per night.